This article is 2701 days old. The Canada Green Building Council has confirmed that Dr. David Suzuki Public School has achieved LEED (Leadership in Energy and Environmental Design) Platinum Status. This makes it the first school in the country to receive this designation. 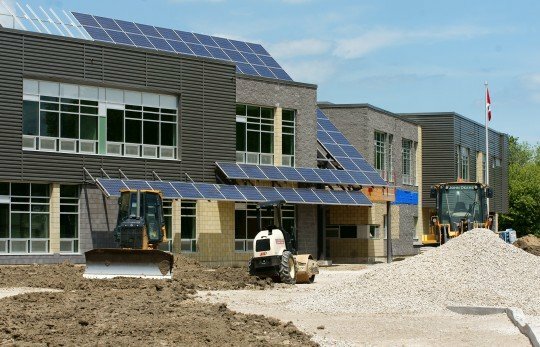 The school, located at 6320 Raymond Avenue in East Windsor, opened in September of 2010 contains 20 proven carbon-footprint reducing technologies that make it Canada’s most environmentally friendly school. One of many unique features to the school is that every day is a Garbage Free Day. As a LEED platinum school, they do not have a dumpster on site for garbage disposal. Dr. David Suzuki Public School was designed by architect Greg McLean and built by Mady Construction. The school achieved 55 LEED credits with only 52 required for the highest rating possible.